All but 2 of the 254 Texas counties shut down their County School Boards back in the 1960s when all students moved to Independent School Districts…. But Harris County still elects County School Trustees 50 years after our last countywide school closed. HB 945 finally shuts down this dinosaur board. Collects $19 Million in property taxes each year ON TOP OF ISD taxes. · Does NOT distribute tax funds to Harris County ISDs as required by TEC 18.14. · Spends a total annual budget of nearly $100 Million with ZERO zoned students. · Uses tax money to pay lobbyists to fight against the taxpayers. · Uses tax money as venture capital to start revenue-positive businesses. · Serves paying customers all over the United States. · Receives “kickback” fees (as high as 33%) on contracts with state/local agencies. · Rewards former board members with lucrative “consulting” contracts. · Allows board members to represent companies selling to HCDE & its co-ops. · If we don’t get it done THIS WEEK, Harris County property owners have to pay this EXTRA TAX for two more years! 1. What is HB 945? HB 945 is legislation filed by Rep. Debbie Riddle that would abolish the offices of county school trustee and county school superintendent in Harris County ONLY. It would leave the Dallas County School Trustees as the sole remaining county school board in Texas. 2. What is a county school trustee? In the early 1900s, the Texas legislature established County School Boards to operate Texas public schools run by elected County School Trustees. Over time, the Legislature allowed more local control of public schools thus leading to our current system of Independent School Districts (ISDs) run by elected ISD Trustees. Every county in Texas closed their County School Boards when all students in their county moved into ISDs except for two – Harris and Dallas Counties. 3. What is the Harris County Department of Education (HCDE)? The Harris County School Trustees filed a Certificate of Assumed Name in 1991 to do business as (dba) the Harris County Department of Education aka HCDE. Their alias name can cause confusion because it leads many to believe HCDE is a “department” operated by Harris County. HCDE is actually the Harris County School Trustees, a political subdivision of the State of Texas, who operated the public schools of Harris County before all students moved to ISDs. 4. 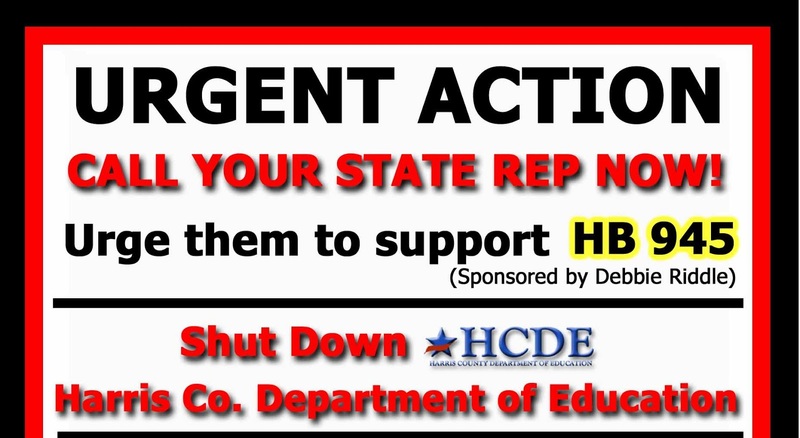 Why does HCDE still exist, when all but one other county school board have been abolished? All Harris County districts became independent BEFORE 12/31/78 so the Harris County school board was not abolished. When the Texas Legislature abolished state funding for county school trustees in 1978 (TEC 17.94), they allowed county school boards that levied their own countywide property tax, called the “Equalization Tax” to remain in operation using those local funds. Harris County voters had approved a countywide school maintenance tax in the 1930s, so the Harris County School Trustees chose to remain in operation using that local property tax for their support. n 1995, the Texas Legislature reformed the Texas Education Code. Because county school boards no longer operated Texas public schools, the Legislature removed TEC Chapters 17 and 18 governing county school boards from the books. 5. What duties and responsibilities do these “former” laws assign to HCDE? TEC 11.301 allows HCDE to operate under former TEC Chapters 17 & 18 as those chapters existed in 1995 and “under state law applicable to school districts that does not conflict with” those chapters. TEC 11.302 requires HCDE to make the former laws governing them available to the public for inspection and copying during regular operating hours. TEC 18.01 allows HCDE to levy a countywide property tax for the maintenance of public schools called the “equalization tax” – which is separate from the property tax levied by local ISDs. TEC 17.08c states the meeting place for County School Trustees is at the county seat in the office of the county superintendent. TEC 17.09 allows each County School Trustee to be paid $6 per day to attend meetings, not to exceed $72 in any one year. TEC 18.30a allows the equalization tax to pay the salary and all expenses of maintaining the office of a county school superintendent. TEC 18.14b requires HCDE to distribute the “Equalization Tax” funds to the ISDs of Harris County based on their average daily attendance. TEC 18.26 limits the “Equalization Tax” to never be levied, assessed or collected for any other purpose than those outlined in the chapter and for the advancement of pubic free schools in Harris County. TEC 18.15d restricts the use of the “Equalization Tax” to never be used to pay any present or future bond issues or interest. TEC 17.31a allows county school trustees to perform any act consistent with law for the promotion of education in Harris County. HCDE does NOT make the former laws governing them available to the public for inspection and copying during regular operating hours as required by TEC 11.302. HCDE’s superintendent does NOT have his office in the courthouse with furnishings supplied by the county commissioners as instructed by TEC 17.59, and the County School Trustees do not hold their meetings at the county seat as stipulated in TEC 17.08c. Instead, HCDE has built a four story, state of the art facility, with multilevel covered parking to house the superintendent’s office and Board Room. HCDE uses the “Equalization Tax” funds for items other than compensation for the Trustees as stipulated in TEC 17.09 and for the salary and expenses of maintaining the county superintendent’s office as allowed in TEC 18.30. Instead, HCDE uses the “Equalization Tax” to fund items like business start-up ventures, research and evaluation, client development services, Texas Center for Grants Development, etc. HCDE does NOT distribute ANY of the $18 million per year collected from the “Equalization Tax” to the ISDs as required by TEC 18.14b. Instead, HCDE claims ALL $18 million is spent paying for the County School Trustees and maintaining the Superintendent’s office. HCDE uses the “Equalization Tax” funds to pay QZAB – Quality Zone Academy Bonds even though TEC 18.15d prohibits tax funds from being used to pay present or future bond issues or interest. HCDE uses “Equalization Tax” funds for the facilities, personnel and County School Trustee compensation to oversee grant programs across the State of Texas, approve contracts for entities across the United States, and provide services to persons and organizations outside of Harris County – even though TEC 18.26 limits the “Equalization Tax” to use for the advancement of public free schools in Harris County. 7. No longer assigned the duty of operating the public schools, what does HCDE do? After their last county school closed in the 1960’s, HCDE redesigned itself into an educational service center, selling services to school districts, governmental entities and non-profits across the United States. Today HCDE competes with Texas Educational Service Center 4 (only 9 miles away) for local school contracts to provide services like alternative teacher certification, teacher in-service training, cooperative purchasing agreements, etc. HCDE also manages Federal and State grant programs like Head Start and Adult Education, some across the entire state. In recent years, HCDE has begun contracting with ISDs for temporary placement of alternative students by opening 4 Alternative Campuses to serve approximately 300 students per year. ISDs from Harris and surrounding counties can pay a tuition fee per student to HCDE for this service. Their largest profit ($2 million in 2010/11) comes from their cooperative service called Choice which provides management of government procurement contracts with fees being paid to HCDE from the cooperative’s vendors. Even though HCDE claims they serve all 26 Harris County ISDs, they also claim to serve over 1300 clients nationwide. In 2012, HCDE’s Board of Trustees approved the use of $1 million to fund the start-up of the Texas Cloud Computing Consortium to serve schools across the state in the hopes of one day making the venture profitable, similar to their Choice program. 8. 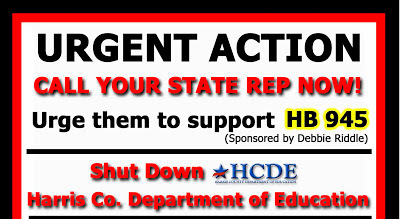 What would happen to the students and schools who receive services from HCDE if it is abolished? Because county school boards were designed by the Legislature to close after students moved to ISDs, Texas Education Code 17.96 & 17.97 already outlines the responsibilities of ESC 4, local school districts, commissioners court, the county judge and the county treasurer when a county board is abolished. TEC 8.053 allows ESCs to “offer any service requested and purchased by any school district or campus in the state” so ESC 4 may absorb any program HCDE is currently providing to schools for a fee. There is no need for disruption of any Federal or State grant service currently provided by HCDE. The HCDE Board of Trustees may make arrangements with ESC 4 or a variety of other non-profit entities to merge programs or take over management of HCDE’s current services. · ECI, Early Childhood Intervention, can transfer management from HCDE to ESC 4 (only 9 miles away) and be successful just as ESC 16 manages ECI services in Amarillo. · Head Start can transfer management from HCDE to ESC 4 (only 9 miles away) and be successful just as ESC 19 manages Head Start services in El Paso. HCDE per day for services used instead of having to keep therapists on staff. This same program can continue with the management operated by ESC4 or another non-profit organization. 9. How does HB 945 fit into Governor Perry’s current Legislative initiatives? 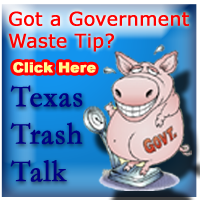 · HB 945 supports the Governor’s initiative to reduce waste and redundancies in governmental services. Currently HCDE, funded by county property taxes, competes for school district business against ESC 4, funded by state dollars, and the two offices are only 9 miles apart. Closing HCDE would reduce waste by abolishing the redundant county school bureaucracy, thus providing local property tax relief, while increasing the financial solvency of ESC 4. · HB 945 also supports the Governor’s initiative to end the practice of using dedicated funds and fees for anything other than the purpose for which they were intended. HCDE has not distributed any of the “Equalization Tax” to Harris County ISDs in many years as dictated by TEC 18.14b.Instead, they claim that all $18-19 million is needed every year to pay the salary and all expenses of maintaining the office of the county school superintendent, and compensation for the Board of Trustees, the only other payments allowed in TEC Former Chapters 17 and18 using the “Equalization Tax” funds. HCDE uses “Equalization” Tax” funds to pay Quality Zone Academy Bonds even though TEC 18.15 does not allow bond payments with those tax funds. 10. Who is against abolishing a county school board which has not had students zones to it in 50 years? Persons who make money from HCDE do not want it to close. Like a previous board member who is paid $100,000 per year as a “consultant” for HCDE. Like another previous board member who earns commissions from HCDE contracts….